The MV Twin Capes ferry joins the acclaimed Del-Jersey-Land artificial reef off the coast of Cape May, New Jersey. 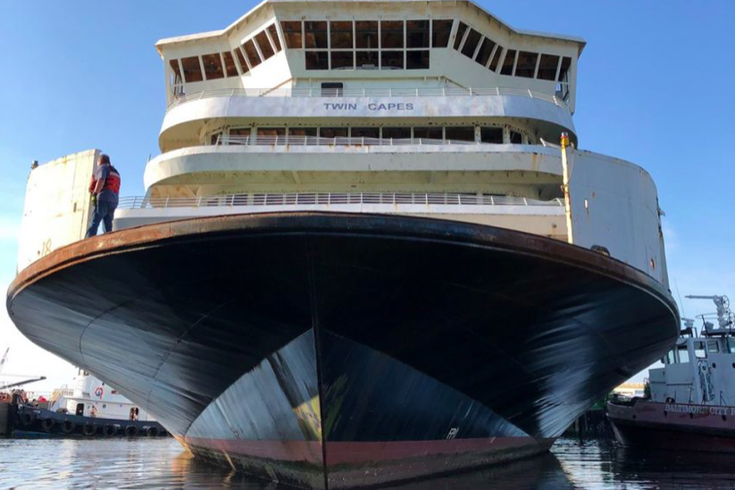 If you've ever wondered what it looks like to watch a 2,100-ton ferry capsize without anyone getting hurt, today is your lucky day. On Friday, the former MV Twin Capes, part of the Cape May-Lewes fleet, was taken to a point 26 miles off the Atlantic coast and intentionally submerged. The ferry joins several other retired ships that form part of an artificial reef system to promote a healthier marine habitat. Video of the ferry's sinking was captured and uploaded to Facebook. The bulk of the action occurred within just six minutes. Twin Capes, one of the original three Cape May-Lewes vessels in the 1970s, was declared surplus in 2010 and was last used for vehicle and passenger service in 2013. The 320-foot long vessel couldn't be sold to another ferry service and was eventually sold to the Delaware Department of Natural Resources and Environmental Control. (DNREC) for $200,000. This Jersey Shore beach named 'happiest' coastal town in the U.S.
A $27 million renovation to Twin Capes in the mid-1990s added a new superstructure with four new decks, multiple lounges, a new pilot house, “shark-fin” smokestacks and a food court. DNREC officials said these structures will make for an enhanced fish habitat and provide compelling opportunities for deep sea diving. A 70-foot vertical profile is expected to attract sharks, tunas and even seasonal barracudas. The Del-Jersey-Land submerged reef also includes the ex-destroyer USS Arthur W. Redford and the Zuni/Tamaroa, a harbor tug that later survived the Battle of Iwo Jima in World War II and eventually became a U.S. Coast Guard Cutter. Officials projected about $230,000 of items were salvaged from Twin Capes or otherwise repurposed for the fleet's remaining three vessels—MV Delaware, MV New Jersey and MV Cape Henlopen.